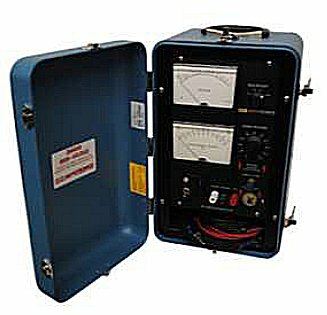 The HVM Series Megohmmeters are designed for portable use in the field or factory. The rugged construction of these instruments is ideally suited to applications in industrial or sub station environments where measurements to 300,000 Megohms at voltages up to 15kV are required. Applications include insulation resistance, polarization index and dielectric absorption testing of apparatus and insulation samples to IEEE, ANSI, UL, MIL, and other standards. A regulated power supply and guard circuit suppression enhance accurate measurements. Surge suppression, short circuit protection and meter recalibration provision guarantee reliable and accurate performance. Test leads are included with each instrument. Continuously adjustable test voltage from zero to rated voltage. Guard circuit for accurate readings. Megohm readings to 300,000 Megohms. Line regulation to minimize effect of line variations. Shorting switch grounds output cable. Press to test - Lockable push-button switch. Surge-limiting resistors in High Voltage output. Ideal for field testing - compact, lightweight and rugged makes it suitable for field orientated applications. Operator Safety - the power supply and test object are automatically grounded when high voltage is turned off and there is no exposed high voltage. Simple to Use - a minimal amount of setup time and a simple control panel allows simple testing every time. Accurate Resistance Measurement - while guard circuit eliminates stray leakage currents.